Osmosis is the movement of a solvent, such as water, through a semi-permeable membrane. (A solvent is the major component of a solution, the liquid in which something else is dissolved.) A semipermeable membrane is a material that allows some materials to flow through it but not others. The reason that semipermeable membranes have this property is that they contain very small holes. Small molecules, such as those of water, can flow easily through the holes. But large molecules, such as those of solutes (the component being dissolved, for instance sugar), cannot. Figure 1 illustrates this process. Notice that smaller molecules of water are able to pass through the openings in the membrane shown here but larger molecules of sugar are not. Osmosis always moves a solvent in one direction only, from a less concentrated solution to a more concentrated solution. As osmosis proceeds, pressure builds up on the side of the membrane where volume has increased. Ultimately, this pressure prevents more water from entering (for example, the bag in Figure 1), and osmosis stops. The osmotic pressure of a solution is the pressure needed to prevent osmosis from occurring. Living cells may be thought of as very small bags of solutions contained within semipermeable membranes. For example, Figure 1 might be thought of as a cell surrounded by a watery fluid. For the cell to survive, the concentration of substances within the cell must stay within a safe range. A cell placed in a solution more concentrated than itself (a hypertonic solution) will shrink due to loss of water. It may eventually die of dehydration. You can observe this effect with a carrot placed in salty water. Within a few hours the carrot becomes limp and soft because its cells have shrivelled. the cell may burst. In general, plant cells are protected from bursting by the rigid cell wall that surrounds the cell membrane. As water enters the cell, it expands until it pushes up tight against the cell wall. The cell wall pushes back with an equal pressure, so no more water can enter. Osmosis contributes to the movement of water through plants. Solute concentrations (the ratio of solutes to solvents in a solution) increase going from soil to root cells to leaf cells. The resulting differences of osmotic pressure help to push water upward. Osmosis also controls the evaporation of water from leaves by regulating the size of the openings (stomata) in the leaves' surfaces. Concentration: The quantity of solute (for example sugar) dissolved in a given volume of solution (for example water). Hypertonic solution: A solution with a higher osmotic pressure (solute concentration) than another solution. Hypotonic solution: A solution with a lower osmotic pressure (solute concentration) than another solution. Isotonic solutions: Two solutions that have the same concentration of solute particles and therefore the same osmotic pressure. Osmotic pressure: The pressure which, applied to a solution in contact with pure solvent through a semipermeable membrane, will prevent osmosis from occurring. 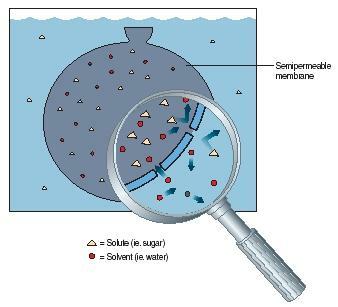 Semipermeable membrane: A thin barrier between two solutions that permits only certain components of the solutions, usually the solvent, to pass through. Solute: A substance dissolved to make a solution, for example sugar in sugar water. Solution: A mixture of two or more substances that appears to be uniform throughout except on a molecular level. Solvent: The major component of a solution or the liquid in which some other component is dissolved, for example water in sugar water. Organisms have various other methods for keeping their solute levels within safe range. Some cells live only in surroundings that are isotonic (have the same solute concentration as their own cells). For example, jellyfish that live in salt water have much higher salt-to-water solute concentrations than do freshwater creatures. Other animals continually replace lost water and solutes by drinking and eating. They remove excess water and solutes through excretion of urine. Preserving food. For thousands of years, perishable foods such as fish, olives, and vegetables have been preserved in salt or brine. The high salt concentration is hypertonic to bacteria cells, and kills them by dehydration before they can cause the food to spoil. Preserving fruit in sugar (as in jams or jellies) works on the same principle. Artificial kidneys. People with kidney disease rely upon artificial kidney machines to remove waste products from their blood. Such machines use a process called dialysis, which is similar to osmosis. The difference between osmosis and dialysis is that a dialyzing membrane permits not just water, but also salts and other small molecules dissolved in the blood, to pass through. These materials move out of blood into a surrounding tank of distilled water. Red blood cells are too large to pass through the dialyzing membrane, so they return to the patient's body. Desalination by reverse osmosis. Oceans hold about 97 percent of Earth's water supply, but their high salt content makes them unusable for drinking or agriculture. Salt can be removed by placing seawater in contact with a semipermeable membrane, then subjecting it to great pressure. Under these conditions, reverse osmosis occurs, by which pressure is used to push water from a more concentrated solution to a less concentrated solution. The process is just the reverse of the normal process of osmosis. In desalination, reverse osmosis is used to push water mole-cules out of seawater into a reservoir of pure water. i am searching for an example of osmotic pressure but ii already know that water moves from high concentrated solutions to less concentrated ones & that water is transported through roots to other parys of the plant are examples of osmotic pressure &i want another example. can you help me please? Please correct the def. for osmosis. It applies to H20 only. Thanks guys,this article is good for us as learners.this article expand our knowledge. how may osmotic pressure be used to remove salt from sea water? Thank you for explaining it in such an easy and clear way to understand :) I've been learning this topic for the whole year and I didn't understand anything. I then come to this site and read an explanation and understand almost entirely within 5 minutes. What are the two components of a solution in osmosis? As a professor of science I found this source truly reliable... Well done! I need help! I have to write a story about my life as a salt molecule inside a animal cell. I have to be specific about the process that allows me to move.. I really dont get this assignment! Please help! Osmosis is a special type of diffusion. It means that WATER moves from an area of HIGH WATER CONCENTRATION to an area of LOW WATER CONCENTRATION across a SELECTIVELY PERMEABLE MEMBRANE. Like diffusion it requires no energy and like diffusion is a form of PASSIVE TRANSPORT..
How does the solute end up in the semi permeable membrane? Doesn't say that only water particles can go in and out the membrane? what else could you include for a revision poster? how does digestion and filtration deals with osmosis? i need help to write a method of how osmosis works? If a bacterium is in a concentrated solution of sugar, which substance will leave the cell and which will move into the cell? What processes are involved?